Like us on Facebook for up to date information on the Missouri River Region! It’s going to be a hot one! Check the weather and be sure to stay hydrated. Have a safe and wonderful time on the Missouri River in Central South Dakota! REMINDER: Help stop the spread of Aquatic Invasive Species! Check out the Game, Fish & Parks web site for detailed info on the regulations. You can trailer to fish cleaning stations nearest the boat ramp, but after that regulations call for draining live wells and boats. If you love to fish the Missouri River in South Dakota, please do your part to keep the reservoirs free of aquatic invasive species. In the Pollock and Mobridge areas the fishing is slowing a little. Limits are still being caught, but you have to work at it – sometimes most of the day. South of town and around the Moreau is decent. Anglers are fishing in 25-35 feet using spinners and crawlers or leeches. At Gettysburg anglers are catching a number of smaller walleye, with some limits of nice fish coming in. Anglers are still using all bait, with crawlers the main bait and some anglers using plugs - fishing in the 25-30 ft. depth. The weather has been making a big difference in when the bite is good. The Smallmouth bite is very good, with anglers bringing in fish in the 3-4 lb. range and some up to 6 lbs. Some catfish are being brought in from the creeks. Around Spring Creek / Cow Creek - On Oahe the bite is fair. Fish are being caught anywhere from 20 feet out to 60 feet of water. The fish are in many different depths right now, so you need to look for them. If you can get on the right ones, you can bring in some quality fish but finding them can be tough. Bouncers and crawlers seem to be working well. Northern, catfish and smallmouth are also going well right now. The smallmouth bite is good in 5 to 20 feet of water. Don’t overlook the smallmouth fishery here, as it is world class. REMEMBER TO DRAIN YOUR BOAT BEFORE YOU LEAVE THE CLEANING AREAS TO COMPLY WITH THE NEW REGULATIONS AIMED AT INVASIVE SPECIES! There have been some nice walleye caught around the Pierre/Fort Pierre area to West Bend. The bite is spotty at times. Depths are around 10-25 feet around the channels and current breaks. Bouncers and crawlers are a great choice for bait. The best bite is downstream from Degray to the Dam. Lake Sharpe continues to put out limits of eater size walleye in around 25 feet. There are smaller fish here, but lots of action. Smallmouths are going well in this area also, in 14 feet or less. Pulling plugs with leeches and crawlers is working well. Be sure to bring plenty of bug spray and plenty of water!! Remember, the 15 inch slot limit on Sharpe goes off July 1 until September. Around Chamberlain , Lake Sharpe is producing good fish from the Big Bend Dam to Iron Nation. Anglers are fishing in 10-30 feet using spinners and crawlers. Some sorting is necessary. On Lake Francis Case the bite is fair and anglers are fishing in 8 to 12 feet depending on the wind. Spinners and bottom bouncers are working the best. Some anglers are pulling plugs over the trees. From Chamberlain to the Dam fishing is good. Lots of 14 to 14.5 inch fish – should be a little less sorting. In the Platte area the water levels are good. With the hot weather over the weekend the fishing was spotty. Anglers are fishing 15-35 feet using crawlers and spinners or pulling crankbaits. Some anglers are pulling plugs over the trees in 35-40 feet. Whatever the depth is over the trees can be a good spot. Smallmouth are biting here also. Fish are looking very healthy. At the Pickstown - Wagner – Lake Andes areas fishing is fair. Anglers are working the weed areas for the walleye. With the higher water level the weeds from last year are covered up and the bait fish are taking shelter there. Again, the fish are there, but you need to look for them and the fish are good and fat! Pulling plugs over trees seems to work well for some anglers. The creeks to the Fort Randall Dam are going good. Crawlers and leeches are working the best for bait in 20-28 feet depths. White Swan, Pease Creek are producing good fish. Smallmouth, perch, crappie, and catfish are still being caught also. At Yankton the fishing is going well here and it looks like it will be a good week weather wise in this area. Minnows and crawlers and leeches are the best for bait here. 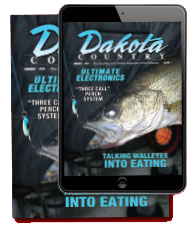 For more information and up-to-the-minute reports on fishing Lake Oahe, please call Kemnitz MoRest Motel in Mobridge at 605-845-3668. At Akaska call Akaska Bait Shop at 605-649-7847. Call Bob’s Resort at 605-765-2500 or South Whitlock Resort at 605-765-9762 in Gettysburg. 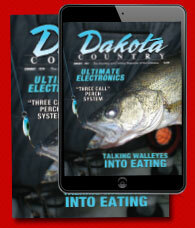 On Oahe and Sharpe call Hutch’s Guide Service at 605-224-4755. On Lake Sharpe and Lake Francis Case, contact Dakota Prairie Guide Service at 605-680-1910. On Lake Francis Case, call Platte Creek Lodge at 605-941-1679 or Circle H Motel at 605-487-7652. Remember – this report is a snapshot in time and changes can occur quickly. We suggest you call one of our members listed above – they can be very helpful with what is happening along the river. That way you’ll be assured of a great trip!